It is Plato’s best-known work and has proven to be one of the most intellectually and historically influential works of philosophy and political theory. In it, Socrates along with various Athenians and foreigners discuss the meaning of justice and examine whether or not the just man is happier than the unjust man by considering a series of different cities coming into existence "in speech", culminating in a city (Kallipolis) ruled by philosopher-kings; and by examining the nature of existing regimes. 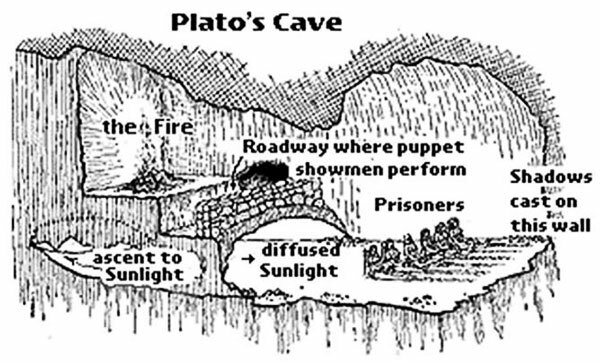 The Allegory of the Cave is a discussion on human mentality and the body politic, our thinking and being. There are four types of people in the cave, though nowhere in the text are the characters overtly counted. In the cave there are the captors and captives. The captives in the cave are controlled and know nothing in life but the cave, worse they only know one wall of the cave. The captors use a fire to cast shadows on the wall the prisoners face to keep them captivated and distracted by a made up reality. Among the captives there are the chained and the unchained. The chained are held in place so that they can only look straight ahead and are convinced of the reality and moreover importance of the shadows. The unchained are transfixed with the images and convinced of the reality and moreover the importance of the shadows to the point they don’t need chains. They are held by shadows, like elephants onto a string. Both the chained and unchained captives have no interest in their actual existence as captives in a cave. They are not conscious, they are not aware of self or their surroundings, or the captors, they are only aware of and concerned with the shadows. The captors hold the captives with shadows, as distractions. There are the chained captives, the unchained captives and the captors who hold them. The fourth character in the allegory, the fourth distinct part of the set, is the freed prisoner. The freed prisoner, after being in the cave his whole life, finds himself aboveground and is at first pained by sunlight and then begins to see. First he sees only shadows as that is what he is accustomed to, then reflections, then the objects casting shadows and then finally the total of his surroundings, himself, others and the stars and the sun. The freed prisoner learns about sunlight and the dependence of all things on it. He learns about the basic tenets of 'reality' and that the sun is the true light, not the captors’ fire. The freed prisoner learns about simple conditions of reality and the things which the captors’ shadows represented. He becomes conscious and understands his place in the world. He realizes he was deceived his whole life and that everyone he had ever known from the cave is imprisoned and deceived as well. And he has to return. After deliberation the freed prisoner returns and attempts to inform the captives of their predicament and, by that, free them. The chained and unchained captives scorn the freed prisoner for not being able to see in the dark cave, his eyes having adjusted to daylight. Eventually they want to eliminate the freed prisoner for revealing their predicament to them, for upsetting the status quo, even though they are held captive by it. The controlling captors of course seek to eliminate him or anyone who questions and exposes the cave system for what it is. The three characters being compelled to remove the fourth distinct type, the freed prisoner, the one who seeks to free the captives and show them true light as opposed to control in the cave, is reflective of how controlling institutions operate. The political and actual representations are easy enough to quantify and the power of the freed prisoner or righteous rebel is recognizable throughout the world. 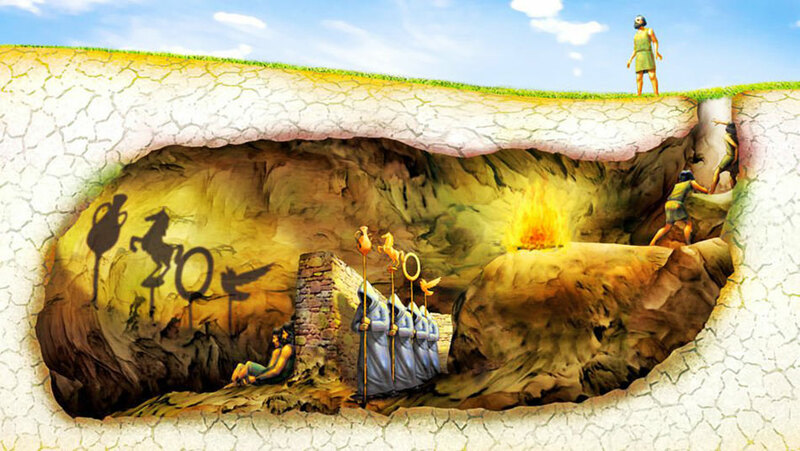 One of the most important layers to the Allegory of the Cave is that of the personal layer of the cave within - the caves people make around themselves. The shadows are false evidence appearing real - fear. The outside world of fires and shadows often uses fear to steer, but inside fear is used the same. A majority of people replay shadows to themselves to keep the status quo inside so they don’t have to face the reality of inside and outside. They have their own personal caves where false evidence appearing real controls them. The freed prisoner, the righteous rebel, is powerful in the world and can lead us out of our own personal caves toward enlightenment. The shadows are very much symbolic of the consensus reality, constantly being programmed and reinforced by the mainstream media, which most people believe to be real. When we follow our intuition, we often find ourselves behaving in ways that the conditioned, imprisoned minds of people around us find impossible to understand. They have to ‘rationalize’ your words and behavior by saying you are ‘mad’, ‘dangerous’ or ‘delusional’, and may behave in a patronizing manner towards you. In fact, you are merely different, viewing reality from another point of observation. Do what your heart intuitively tells you, for it is Consciousness speaking - the Silent Voice.